The second week of June, I had the pleasure of spending a week in Hawaii thanks to an all-expenses paid trip. (Thanks again, Steve and Chris.We had a great time.) While there I learned more than a few things. I learned a guy that is rather round at the middle should stay far away from two-person kayaks – that revelation didn’t surprise many of my friends – and I discovered that a mustache prevents a dive mask from attaining a seal strong enough to keep water out of your nose when snorkeling. That was the first day’s events. On the positive side, I learned that hiking in the rain forest and jumping from cliffs into water filled via a waterfall is a blast, that sunset cruises on sailboats are relaxing even though you have to wade through knee high ocean to get aboard and that a “lava flow” cocktail at the Four Seasons Resort is mighty tasty. One more thing. If you ever have a chance to get out of bed at 2:00 in the morning, ride in a van for an hour to pick up gear for an sunrise bike trip down from Haleakala’s 10,023′ summit, TAKE IT. It’s magnificent. We were above the clouds as the sun rose. We stood in 40 – 50 MPH winds in temperatures around 30 degrees, but it was so worth it. 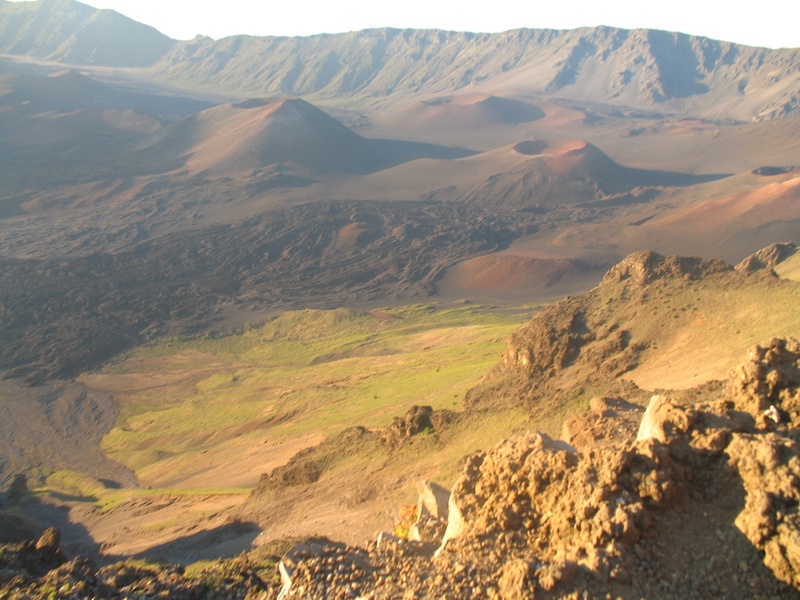 Then before the bike ride began, we stopped to take in an incredible view of Maui’s crater. It looked as if we were on another planet. What does all this have to do with woodworking? Each day of the week the Resort invites in artists from many different mediums. 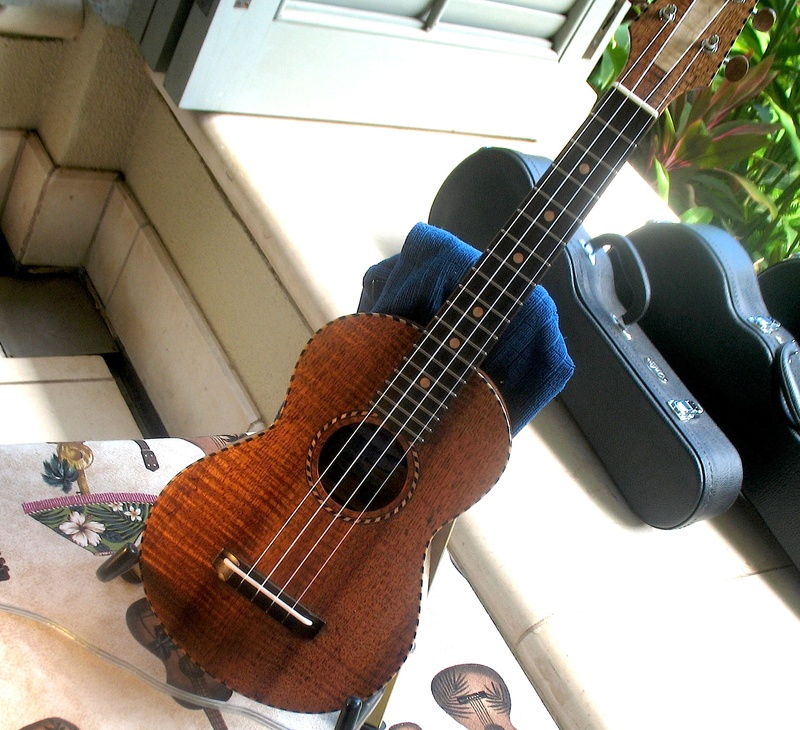 Day one of my stay included a ukulele builder. 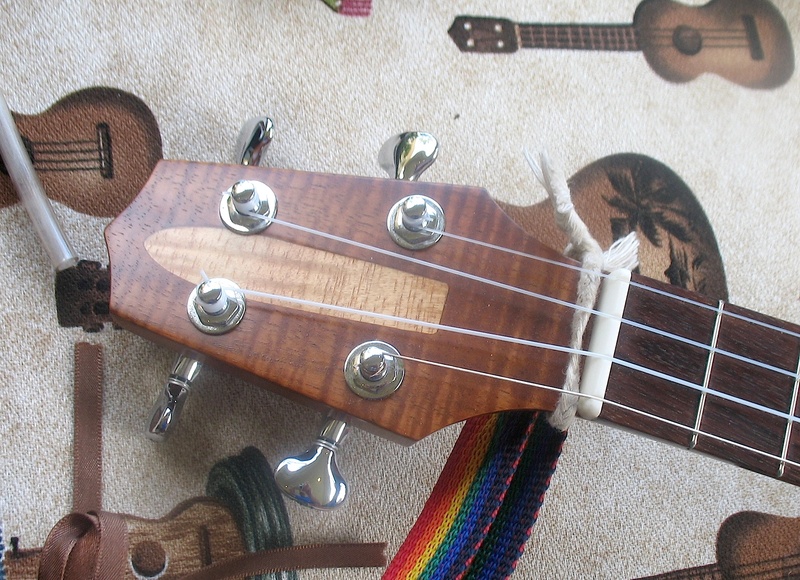 I spent a while talking with Colly Norman of Blue Maui ‘Ukulele. As he showed me his ukuleles, he introduced me to a wood that I knew nothing about, Mangifera indica or mango in layman’s terms. I did not know that this wood existed, or was harvested for use, and I surely didn’t know it was available in a high-figure variety. Don’t shake your head yes. I dare you to tell me you’ve seen this before if you live any where on the United States mainland and haven’t visited a tropical paradise. I think it’s a secret kept from woodworkers that favor figure. Immediately, I began my search for mango. I need to build something in mango just to say I have. (Here is a page with all the technical data, click here.) An online search shows many small pieces, but I want slabs. Then I stumbled onto Keim Lumber Company’s Mango page and received a bit of a shock. Check out the price. Maybe small pieces are the way to go? Then I found mango at Roy Lambrecht Hawaiian Woods and mango, at $15.00 per board foot for curly, was back in the running. I’m still in the hunt. Even though the above linked data base doesn’t mention any toxicity, Colly told me that mango was a wood that some woodworkers cannot work due to a potential skin irritant much like poison ivy. I have also found that Mango wood should never be used in fireplaces or for cooking fuel, as its smoke is highly irritant. 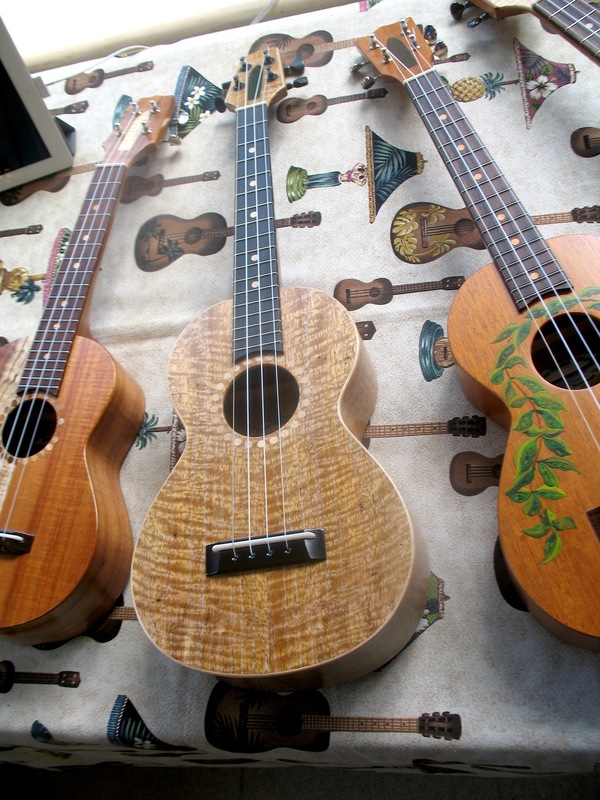 Below are a few more photos of Blue Maui Ukulele instruments. 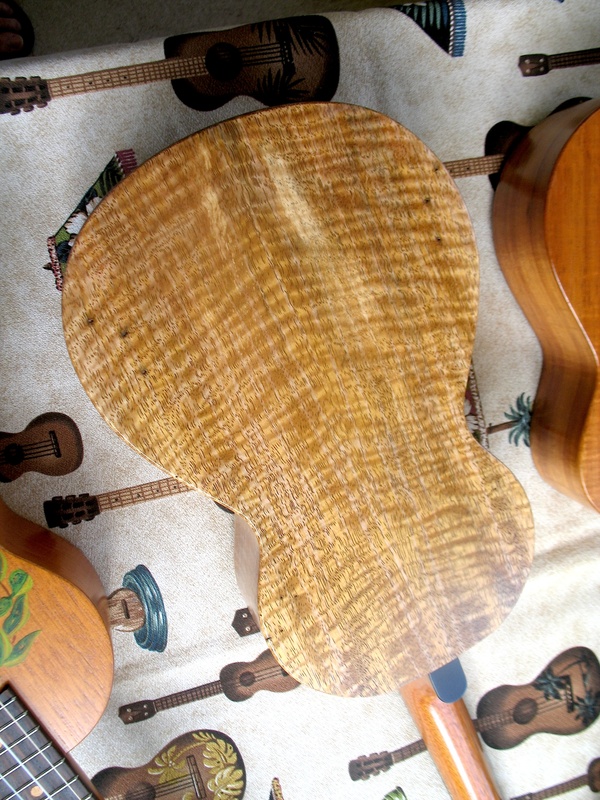 Check out the inlaid surf board, which is Colly’s signature. Very Cool.